"The nature of glass presents the opportunity for unlimited form and color. A great period piece shows sophisticated form in fine color, yet the evidence of a hand. If there is an example of this category you are looking for and do not see, please call or email, we may not have cataloged it yet." 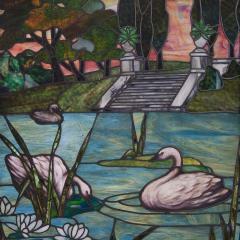 An exceptional stained glass composition of swans in the foreground with a neoclassical landscape in the background.